In call centers, performance metrics help capture internal performance and can include productivity measurements and the quality of service provided by the customer service advisor. These metrics can include: Calls Answered, Calls Abandoned, Average Handle Time and Average Wait Time. A criticism of performance metrics is that when the value of information is computed using mathematical methods, it shows that even performance metrics professionals choose measures that have little value. This is referred to as the “measurement inversion”. For example, metrics seem to emphasize what organizations find immediately measurable—even if those are low value—and tend to ignore high value measurements simply because they seem harder to measure (whether they are or not). To correct for the measurement inversion other methods, like applied information economics, introduce the “value of information analysis” step in the process so that metrics focus on high-value measures. 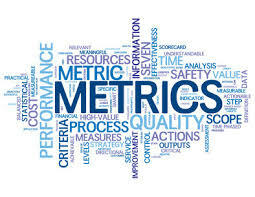 Organizations where this has been applied find that they define completely different metrics than they otherwise would have and, often, fewer metrics. For projects, the effort to collect a metric has to be weighed against its value as projects are temporary endeavors performed with finite resources.